To kick us off into 2018, congratulations to our January Certificate of the Month Winner, Julius Correia, Assistant Manager, Global Training with Catus Communications and an affiliate with Editage Insights from Mumbai India. Editage Insights is a global, multilingual learning and discussion platform for authors, journals and other scholarly publishing professionals. Editage Insights offers researchers training on various aspects of academic publishing, through interactive courses, workshops, and webinars – and is available in 4 languages globally: English, Chinese, Japanese and Korean. 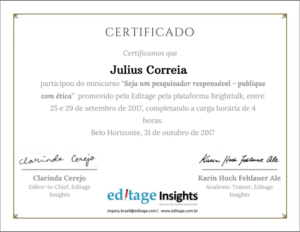 Editage Insight’s webinars are designed around certification courses; those candidates who successfully complete a course are awarded a certificate of completion. Editage Insights utilizes the SimpleCert platform to manage and distribute their completion certificates. Julius utilizes the multi-language capabilities of SimpleCert to customize his certificates, based on the country that the workshop or course was centered in. Julius is also our first Certificate of the Month recipient from India – Congratulations Julius! Thank you for utilizing SimpleCert as your Certificate Management System, and for being a valued member of the SimpleCert community!